(Continued from Welcome page) was formed in 1995 to purchase it from the family that built it, and to operate and restore it. Using a corps of over 300 volunteers for operations, the board was able to transform the Rialto into a regional performing arts venue, while maintaining it as a safe place for our children to gather, learn, and be entertained. Concession income and rent covered operating expenses, and grants and memorials funded a new boiler and electrical systems, upgrades to the marquee, restrooms, stage lighting and sound systems, and carpet. The board has a proven record of over twenty years of fiscal responsibility and careful operations. On November 4, 2006 a massive fire, of still undetermined origin, severely damaged the Rialto. 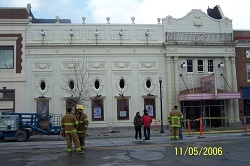 The auditorium, lobby, balcony, and restrooms were lost, but the ornate terra cotta facade, sidewalls, projection booth, and stage area with six original 1921 backdrops were saved by three fire departments. We removed over 73 semi-truckloads of debris, stabilized the sidewalls, and put on a new roof to enclose and protect the space. Actual reconstruction began in July, 2008 and was essentially completed in May 2012. Our historical architects, engineers, and general contractor estimated that restoration would cost about $3.5million, to replace what we lost with a 485-seat functional, accessible, multipurpose facility that we can afford to operate and that will meet the community's needs, and we did that over 6 years. Reconstruction was broken into four large phases, and work on each began as funds were available, using donated labor and materials when possible. The complex building code issues for theaters, acoustical requirements, and preservation concerns were all addressed in the design, and donations came from over 4,000 donors from across the country. The board and area residents were fully committed to rebuilding, as an issue of community vitality and as something we had to do for our children and future generations. Our success is being measured by the finished facility and how well we stayed on budget for this huge endeavor. 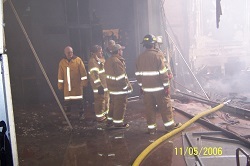 The fire in the Rialto was November 4, 2006. January 2007 - the new large door was built on the south side of the building to allow excavators, trucks, and cranes into the Rialto. 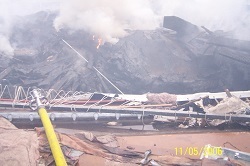 Over 66 large truckloads of debris were removed from the facility then, and more has been removed since. April-May 2007 - steel support posts on concrete pads are installed to stabilize the sidewalls, and to provide support for the roof trusses. June-July 2007 - trusses spanning the width of the building are put in with cranes and a new roof is put on the building to protect it from the weather. May-June 2008 - construction design completed, including building code compliance (especially strict for theaters,) and plans reviewed by contractors, building inspector, state electrical bureau, and Historic Preservation Office. Over $550,000 was trimmed from the original construction estimates by moving beams, changing materials, and other design modifications. The old Rialto had 720 seats, 410 downstairs and 310 upstairs accessed by a long ramp which was too steep to be rebuilt legally. The new Rialto has about 500 seats, with 300 downstairs and 200 upstairs, with more leg room, stairs, and an elevator. It is accessible, functional, more energy efficient, and more affordable to operate, while retaining its historic character. July 7, 2008 - construction began on the first of the 4 large construction phases with the erection of a large work platform. Insulation, electrical conduit, sprinkler systems, and ductwork for the large air handlers required by current codes were all installed in the attic, and the new ceiling was built and painted. The decorative items on the ceiling, which had been painted directly on before, were replaced by panels painted by volunteers with stencils, and are now functional as well as attractive. Above the center cross pieces, which move, are the stage lighting trusses that will replace those formerly on the front of the balcony. Phase I was completed November 18, on schedule and 15% ($71,000) under budget. November 19, 2008 - Phase II began with the removal of the rest of the concrete and the excavation of the lobby area to build a crawlspace under the floor for plumbing and electrical service. It included framing of the walls up to the third level, renovation of the entry, setting the mechanical units, some of the heating system, new electrical panel, and fire sprinklers in the lower levels. It was essentially completed in mid-March, 2009. Phase III was divided into several large parts. IIIA included installing the steel beams and stepped trusses for the balcony in late February, some ductwork and electrical rough-in, and building half of the utility tunnel that runs from the lobby to the basement. The other parts of Phase III involve the stepped concrete for the seating, completing the electrical rough in and plumbing rough-in, and work on the heating system. All of the materials from the Phase I work platform were recycled into other parts of the building. By fall 2009 almost all of the sheetrock for the front end had been hung, the concrete steps were poured in the auditorium, including the tubing for the infloor heat, and the outside water and sewer sewer lines were installed. Taping of the sheetrock was finished and much of the facility was painted. Phase IV began in 2009 and is essentially finished. It included installing the boilers, huge amounts of mechanical work, more painting, wood trim, dozens of doors, plumbing and plumbing fixtures, more wiring and the electrical fixtures, rebuilding the fire escape, some historic finishes, and all the other items that had to be done before we could get a "certificate of occupancy" and open again. The remaining work in the final phase, like the first three phases, proceeded only as funds were available. Work on the front doors and windows and marquee repairs, funded by a CTEP grant through the state and City, was completed in January 2012. Installation of the elevator, new digital projection system, and concession equipment was completed in May 2012. The grand reopening was on May 19, 2012, featuring a gala reception, open houses, free movies and other activities. A little more painting remains to be done, as well as finishing the orchestra pit, insulating the stage area walls, upgrading the stage curtain rigging, and other little things. Our volunteers have raised over $3.7million from over 2,800 donors locally and from across the country, including many former residents and many who have never seen or used the Rialto. We made good use of donated labor and materials whenever possible and practical. The new Rialto retains the character of the old but is not exactly the same. Most of the historical finishes came at the end and were a tiny portion of the overall construction costs. We worked as fast as we could, and found many ways to safely trim costs and improve the design. In September 2012 the Rialto was awarded the "Excellence in Historic Preservation Award" for outstanding rehabilitation by the Montana Preservation Alliance, and was honored at a ceremony in Helena Montana. The Rialto was also nominated in 2012 to the National Trust for Historic Preservation for national historic preservation honors.